What a great #BAMB celebration! What a great Books Are My Bag celebration we had this year! 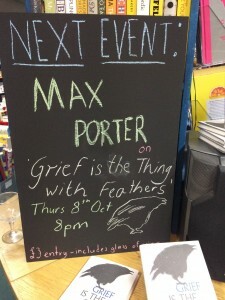 We kicked off on Thursday with Max Porter discussing his debut novel Grief is the Thing with Feathers. 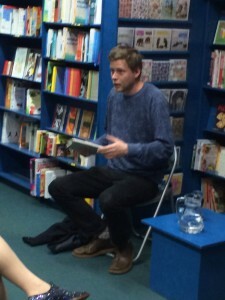 Apart from it being the most amazing book, Max’s readings, and the question and answer session with the audience held everyone captivated. 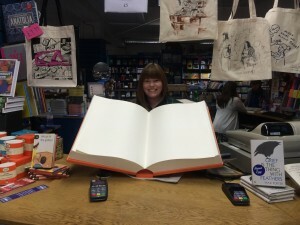 You could have heard a pin drop- unheard of in our usually bustling, busy bookshop! We have a few signed copies of the book left so hurry down if you are interested in owning one of THE books of the year! 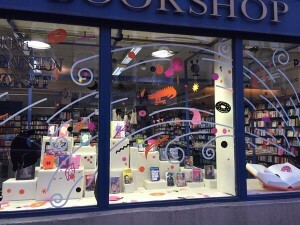 We continued the celebrations with our Saturday bookshop ‘art-in-action’ party with a new window display by the Puck Collective featuring an amazing gigantic paper book exploding with vinyl artwork. Who says a doughnut, a lobster and a polar bear can’t come from the same book! The windows will stay in place for the next few weeks so make sure you pop by and have a look. 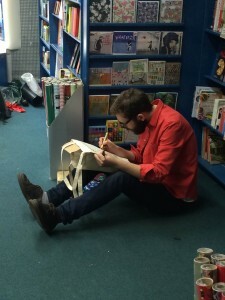 Finally we had the First Hand Reportage Illustrators in store all day capturing the customers and staff for our limited edition tote bags. 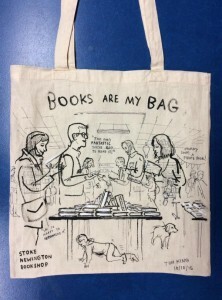 Sold before they were even finished, there are some very happy customers walking around London with one-off Stokey Bookshop totes! Our newest employee Felix even had a bag devoted entirely to himself, looking very professional behind our lovely counter as he sold totes and books. With such a great week the question is…what are we going to do next year?